Yesterday, I went to check out Toys R Us up in N. Attleboro. I found their last Clone Commander Cody from the 2009 Legacy Collection! I have been looking for this guy everywhere, all my local stores are sold out of Cody. Surprised I found him where and when I did. Hey, I think it was a good find. I'm happy! 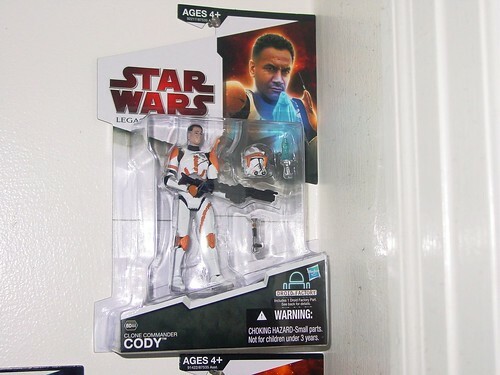 wow ya, a legacy collection commander cody? all i see is the clone wars ones. great find. I found this guy in almost the very back of the all the other figures. Happy to have found him! I saw him just the other day in a Walmart in Plano. He was at the front of the peg. Of course, he is gone as of this morning. I was at TRU in North Attleboro again, yup yup... and to my surprise they had another Legacy Collection "Clone Commander Cody" out on the very front peg. Like WHAT THE HECK! when I try to find him I can't, and then when I do find him he's everywhere after that! Heh, what ever, I would of gotten him again if I hadn't gotten the Imperial V-Wing TRU Exclusive (which I am very happy with ). Holy crap, that same exact thing happend to me with some star wars legos. Lukes land speeder, i had seen it then it went away and i spent forever looking for it then it came back to the shelves and i bought it immeadiatly and after that there everywere now... makes me so mad. Here's a tip for correcting the belt error for Commander Cody (Hasbro put it on upside-down): take a hair dryer and warm up your figure extra toasty. Then, once the plastic is supple, work the belt down over the hips and legs (it's going to take some effort). Once it is off, flip it over and work it back on again. After the figure cools off, the plastic will get firm again and - voila! - a corrected Cody belt!